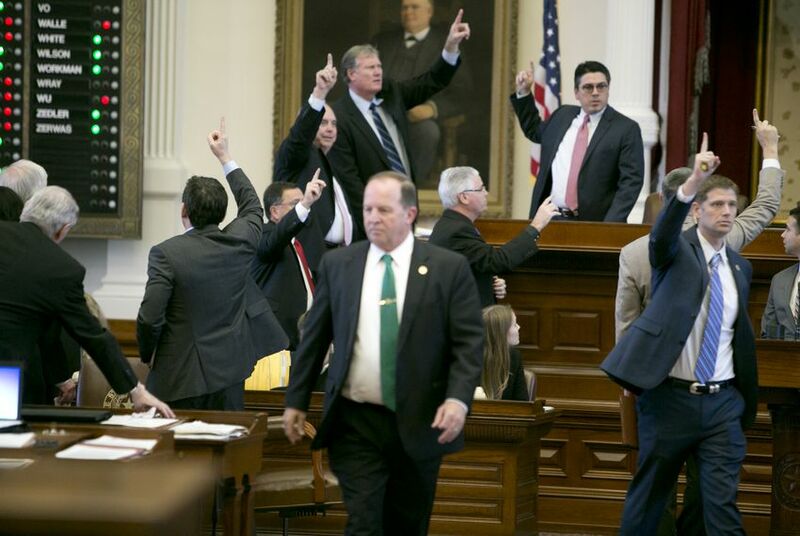 The vote came at 3 a.m. after state Rep. Dennis Bonnen, R-Angleton, successfully made what some Democratic members called an unprecedented motion to group all of the remaining amendments — more than 100 — and record them as failed. He said he made that suggestion so members wouldn't be forced to pull their amendments. The motion passed 114 to 29, with about a third of Democrats approving the measure. The intent of bill is “getting dangerous criminals off the street. That's the mission. Shouldn't be any more than that," Cook said. The bill keeps a provision that makes sheriffs, constables and police chiefs subject to a Class A misdemeanor for failing to cooperate with federal authorities and honor requests from immigration agents to hold noncitizen inmates subject to removal. It also keeps civil penalties for entities in violation of the provision that begin at $1,000 for a first offense and swell to as high as $25,500 for each subsequent infraction." Democrats also offered myriad amendments that sought to shield people at certain places from being subject to the provisions of the bill. Those include domestic violence shelters, homeless shelters, pre-kindergarten schools, and public school events such as football games. All failed along party-line votes. The emotional debate that members witnessed early on in the afternoon continued as the daylight faded. At one point, Rep. Mary González, D-Clint, told members that she was once a victim of sexual assault and said immigrants would fear reaching out to police should something similar happen to them. She pleaded with members to keep the language about status inquiries limited to only people under arrest. “If you ever had any friendship with me, this is the vote that measures that friendship," González pleaded. But amendments by her and her Democratic colleagues were shot down repeatedly before the final vote on the bill. Throughout the floor debate, House Democrats had done everything from warning Republicans against heckling them to shedding tears during floor speeches. Before debate on actual policy started, Democrats tried their best to tug at Republican heartstrings in hopes of diluting what they labeled an “intentionally” racist proposal. State Rep. Ana Hernandez, D-Houston, recounted through tears how she was undocumented for years after her visa expired when she was growing up. She said the bill exemplifies the fear her parents experienced "each day their little girls went to school. Worrying about an immigration raid.” Hernandez gave a similar speech in 2011, the last time the Texas House took up a “sanctuary” measure. Addressing “sanctuary” jurisdictions was declared an emergency item by Gov. Greg Abbott in the early days of the 85th legislative session. SB 4 passed the Senate in February. Houston-area Reps. Gene Wu and Harold Dutton, both Democrats, added their own opinions Wednesday. A choked-up Wu said the bill was personal to him as an immigrant, and he recounted the fear the proposal has stirred in his district. Dutton calmly recited the history of what he deemed racist pieces of legislation and their effects on women, Chinese immigrants, former slaves and other minority groups. Through it all, Geren stood his ground and said the bill wasn’t about targeting minorities or about racial profiling. Geren said it's about focusing efforts on deporting undocumented criminals. State Rep. Jason Villalba, R-Dallas, had Geren’s back. He said his immigrant relatives were called “spics” and “wetbacks.” But he said the bill was commonsense policy that was about the rule of law. The House version has a provision that forces college campus administrators to comply with the bill, which Democrats have argued could get college students deported for relatively minor offenses such as being a minor in possession of alcohol. Proponents of the legislation say it is about the rule of law and ensuring law enforcement agencies follow the same policies. “This bill ensures that there is predictability that our laws are applied without prejudice” no matter who is in custody, state Sen. Charles Perry, R-Lubbock, said when the Senate voted on SB 4 in February. Opponents of the measure say it would make communities less safe as many undocumented immigrants would be reluctant to reach out to police for fear of being deported. They also fear it would open the door to racial profiling and argue it’s not needed because local jails already cooperate with immigration officers. Tensions in the House began percolating this week when Democrats successfully blocked a procedural maneuver known as a calendar rule. The rule would have set a 1 p.m. Tuesday deadline for proposed amendments to SB 4. Democrats said that would have given Republicans too much time to study the amendments and find ways to cut off debate. Wednesday’s debate comes just a day after Austin Mayor Steve Adler revealed that, according to what U.S. Attorney General Jeff Sessions told him at a meeting about what the federal government considers a "sanctuary" jurisdiction, neither Austin nor Travis County is considered one. It also comes after a federal judge on Tuesday ruled that President Donald Trump exceeded his authority when he signed an executive order withholding federal money from "sanctuary" cities in the country. The judge ruled that only funds related to immigration enforcement can be withheld, according to the Associated Press. Watch the Texas House debate the bill at the top of this page. The latest version of the Texas Legislature’s bill to outlaw "sanctuary cities" in Texas is a scaled-down version of what the state Senate passed out in February. Former immigration and border officials say the Trump administration is floating ideas related to immigration that range from nullifying treaties to expanding employment screenings.